While Southern California may be best for the beach boys and girls, the state’s North Coast beaches are perfect for heartier souls! As you leave San Francisco’s Golden Gate National Recreation Area behind and head north along the California coast, you cover almost 400 miles of thinly populated, very rocky and rugged terrain. The north’s more frequent river mouths deposit silt and other soils along its coast, and its beaches tend to be more muddy than sandy. Driving north on Rt. 1 from Marin County, you reach Sonoma Coast State Beach. This is actually a string of beaches, and if you get off the road and take the bluff-top trail you’ll be treated to some wonderful views. 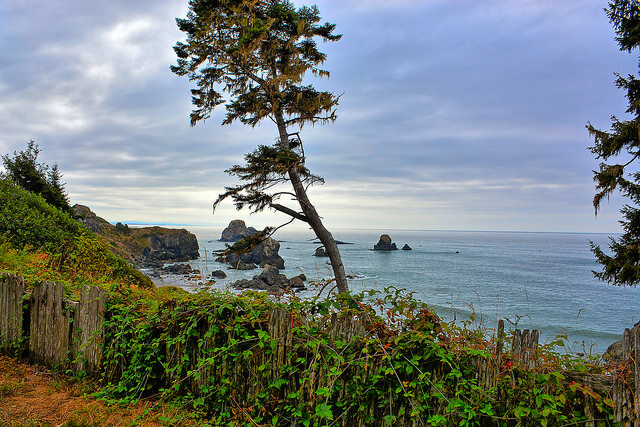 You may also want to seek out Goat Rock Road, which will put you within an easy walk to some of those “hearty soul,” blustery North Coast beaches. The wind makes this area chilly year round, so be prepared with appropriate clothing. If you’re warm enough, you’ll be able to take a moment to enjoy how the Russian River — the northern boundary of Sonoma Coast State Park — cuts and curls as it approaches and enters the ocean. Moving on, Rt. 1 then climbs and cuts back and forth along the cliffs. This is a stunningly picturesque California coast drive, second only for us to the views you can enjoy around Big Sur on the Central Coast. Salt Point State Park boasts an undersea park where SCUBA divers and skin divers explore the kelp beds, caverns and rocky promontories. Miles of trails support serious hiking, horseback riding, camping and great fishing. While you’re in the area, check out the Kruse Rhododendron State Reserve next door. It’s truly remarkable. Gualala is a town (and river) that divides Sonoma County from the next county north, Mendocino. A public beach on the south side of the river and private lodging options on the north side and in town make Gualala a popular vacation destination. 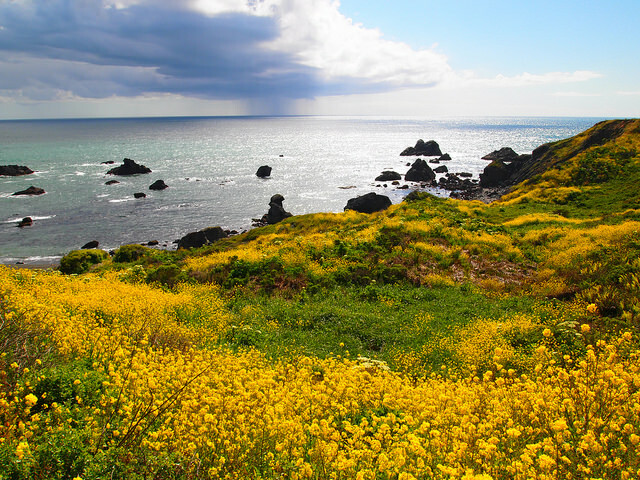 Gualala is great, but in our opinion Mendocino County is the best place to enjoy North Coast beaches. A favorite is Manchester Beach State Park, where you can enjoy camping, hiking and fishing along five miles of sand dunes, beaches, bluffs and grasslands that stretch all the way back south to Pt. Arena and the lighthouse and museum you can enjoy there. Eureka is an active port and mill town, still thriving off the nearby redwood forests but diversifying to become a services center – including some tourism. The beaches on the barrier peninsulas that protect the Eureka harbor (Humboldt Bay) are deserted, yet close to all the amenities a traveler might want. North of town is a cute, isolated cove at Trinidad State Beach – right off the highway and worth seeing. A bit further on is Patrick’s Point State Park, with picturesque paths along sandy beaches and sheer cliffs that rise above them. Like most North Coast beaches, Patrick’s Point is for strolling — not so much for swimming — but watching whales and gazing on hearty wildflowers, gnarly driftwood and soothing sunsets is a different kind of exercise and enjoyment. Great camping, a visitors’ center, picnicking and trails will delight all outdoors fans and their families. Redwoods Park covers thousands of square miles on the mountain side of the road, and a series of parks and state beaches embrace the shoreline here almost uninterrupted to Crescent City and the Oregon border 30 miles north. Again, come prepared for the weather. Temperatures in this part of Northern California range from year-round chilly to downright blustery in the winter. Come prepared, as well, to enjoy the North Coast beaches. They’re desolate, pristine, absolutely gorgeous and definitely worth exploring on foot, by bicycle or by car. 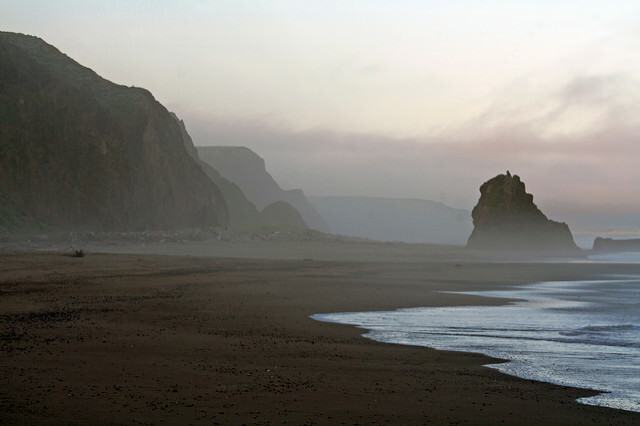 Photo of Shell Beach, Sonoma Coast State Beach by Craig Given via flickr (Creative Commons); Photo of Sunrise at Irish Beach, Mendocino Coast, California by Sharon Mollerus via flickr (Creative Commons); and Photo of Luffenholz Cove, Trinidad Bay by Kirt Edblom via flickr (Creative Commons).